We’d love your help. Let us know what’s wrong with this preview of This House of Wounds by Georgina Bruce. To ask other readers questions about This House of Wounds, please sign up. 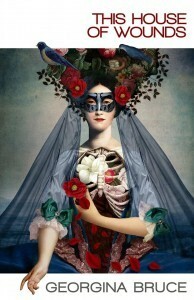 Cover art by Catrin Welz-Stein. This House of Wound is a challenging collection which proves the point that nothing worth having comes easily. I’m still thinking about what the book as a whole means. Don’t be put off by this. It’s an investment that will pay dividends. Georgina Bruce’s prose is dense, lush, sometimes overripe, sometimes surrealist, depending on the needs of the story. The stories are shot through with unifying threads of women being shattered both physically and emotionally, then remade. Of abuses of power on many different levels, of how reality is distorted by said power to keep the protagonists questioning their own sanity, how the mantle of power is gifted or seized. Of sisters, mothers and lovers. In a night that was like the mouth of a bear, a thick tangled forest of a night, the Queen Beast walked. She was tall and deeply rooted as a tree. Vines tangled under her boots as she stalked the night with her high legged walk…. (The Shadow Men). I suspect some readers will be drawn to the more accessible pieces here (Cat World, The Art Lovers) but there are greater joys to be had in the more difficult work (The Shadow Men, The Queen of Knives). If Georgina Bruce is demanding of her readers, she’s as equally demanding of herself. She has technical skill in spades, which you can see in the varying styles she uses. But she also has courage to write what she feels, not just what she thinks, which elevates this above an intellectual exploration of pain.